View of South Foreland in Kent. South Foreland (and North Foreland) are two chalk headlands overlooking the Straits of Dover. 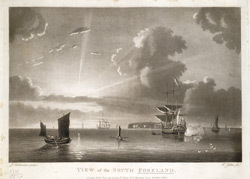 South Foreland is a couple of miles north of Dover. It was a busy area for shipping as this print shows. Each headland has a light house and a view which looks across the channel to France.